Hard drive placed in computer is not used as one big partition, and it is usually partitioned into several partitions. Hard drive partitions are sections or parts on hard drive, and files and folders are stored on partitions. Operating system is generally installed on primary partition, which is separated from data partitions. It is quite easy to create partitions with disk management programs such as PartitionGuru, and it is equally easy to lose partitions or damage partitions. For example, partition may be destroyed by virus or malware; partition will be inaccessible if file system goes wrong, hard drive repartitioning may wipe original partitions, partition table corruption also leads to partition loss. Partition recovery program is capable of helping us fix these questions via partition recovery. Partition recovery can be comprehended as the process of retrieving lost files from inaccessible, damaged or corrupted hard drive partitions. And this process can be performed by partition recovery software without much effort. PartitionGuru is advanced and well developed partition recovery software as well as useful partition management software. It can recover lost or undelete partitions and recover files from corrupted partitions for cases of unintentional deletion, virus attack, partition corruption, file system damage, etc. This partition recovery program comes with an easy interface which doesn’t require that users should have so many computer skills or partition recovery experience. Besides, it is applicable to all Windows system and supports both NTFS and FAT partition recovery, which is safe and full-featured software to use. Step 1, Launch PartitionGuru. 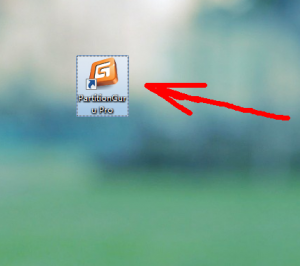 Double click the icon on desktop. 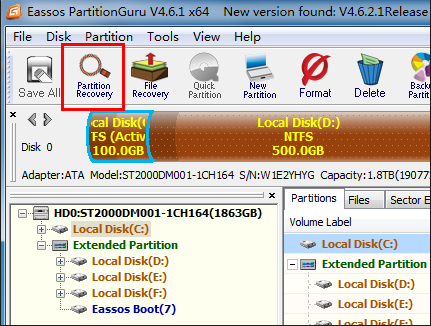 Step 2, Select the hard drive which held those lost partition and click the button ‘”Partition Recovery” on the interface. Step 3, The programs is searching for lost partitions. Step 4, Save partition table. This entry was posted in Data Recovery, Partition recovery and tagged partition recovery, partition recovery software, recover lost partitions, undelete partition by EASSOS. Bookmark the permalink.